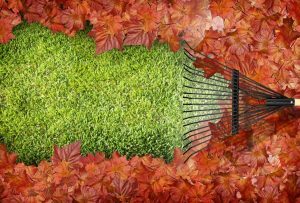 Mow- At the beginning of the fall, your lawn still needs to be mowed a few more times. Rather than breaking your back to rake your leaves, why not mow? You will cut down on the work that needs to be done, and your lawn will benefit from the nutrients in the leaves. Rake downhill- If your yard has a slope, make gravity your friend by raking downhill. This will make your job go by a lot faster! Rake with the wind- If it is windy on the day that you decide to rake, use the wind to your advantage. Don’t forget to wear gloves- No one likes blisters, and the best way to avoid them while raking is by wearing gloves. Find the right rake- Choosing the wrong rake will only put unnecessary strain on your back. Go to the store and get a feel each type of rake that they have, before you buy one. Mulch as much as you can- You can use your dead leaves to make a nutrient-rich leaf mulch. This will save you from have to pick up so many leaves, and you will love that you won’t have to buy mulch!